You are here: Home / Banking / Video Tutor-How to fill the NACH Application Form? Video Tutor-How to fill the NACH Application Form? Now from 1st May, 2016 NACH is mandatory and which is replacing ECS format of registration. But I found many finding it difficult to fill it. Hence, thought to create a video which can help many. Usually, many of us used to register ECS for SIP of Mutual Funds, Utility Bills, Insurance Premiums, Credit Card Bills, or any payment, which you feel recurring in nature. However, as I said above, from 1st May, 2016 NACH will come into picture. I already wrote a detailed explanation of what is NACH and how it is beneficial to all of us. You can read that post from below link. 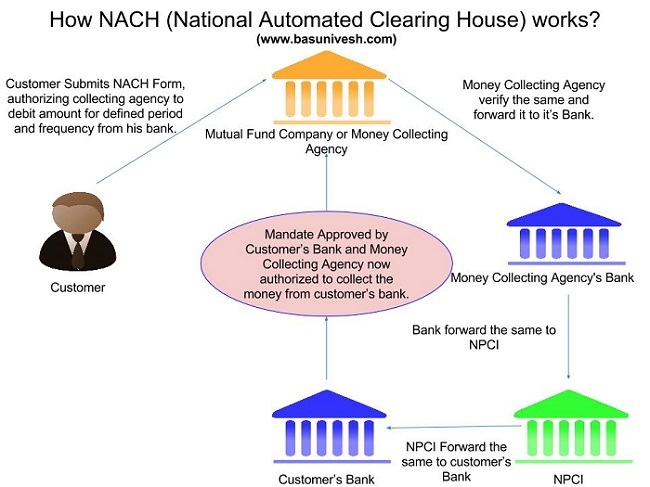 For the benefits of users, I am once again simply sharing this image to show how the NACH process works in real. I found that and heard from many that there are huge rejection in NACH applications from bank end. The main reason for rejection is a signature mismatch. Also, many of us of not aware of how to fill the NACH application properly. Considering all above points, I found it necessary to create a video tutor. Hope you like the below video and share with all. I already mentioned few points in this video, which are very much important while filling NACH form. For the benefit of readers, I am once again pointing it here. Don’t leave the fields which are mandatory to fill. Leave the fields which are not meant for you (I already explained those fields in above video. Never try to overwrite, alter or using white ink. Treat this form as if a bank cheque leaf. Hope this information will be helpful for all of you. Your blogs are really helpful and amazing. This is my current SIP portfolio and my invest horizon is 10+ years. My age is 32 and currently building wealth for my kid’s education and for future savings. 1) Please review my portfolio and let me know how the funds are performing? Any changes you recommend? 2) Apart from FD’s what are the best funds/options to invest for a short period say 2 years to get slightly higher returns? Karuna-1) You just need two funds like HDFC Top 200 and ICICI Discovery. Do you think LIC debt product? Are you able to balance like investing more in same LIC policy? Think twice. Thanks for your response Basu. Yeah i know i am investing heavily in LIC and i started 9 years back in New bima gold – money back (30K) and Jeevan anand (20K). I am willing to close Bima gold but worried how much would be my returns. Hence i had to continue this.Still 11 years to go with both policies? Please recommend your suggestion? Any specific fund house you recommend under Arbitrage funds? Karuna-BSL MNC fund is not a small and mid cap fund but a sector fund which mainly invest in MNCs. Hence, I consider this as sector fund. Stay away from such fancy names. 11 years of LIC payment is long one. Instead I suggest you to try for surrender (loss may be there and think about it based on how flexible you are to bear the loss). You can go with ICIC or Kotak Arbitrage Funds. Thank you Basu for the response. Anand-Without knowing the goal, how can I guide you? Abhijit-As of now both funds doing good. Abhijit-I dont know your tenure of investment. Then it is hard to guide you. Abhijit-What about Axis and Tata? Abhijit-Stay away from equity if your time horizon is just 5 years. Abhishek-In 16th field, you have to mention the amount of income for which you are submitting this Form 15G. In 16th field, you have to mention your total estimated income (include the amount of field 16th). Because I have running ECS from MFU………….AND ECS for bill payments from hdfc bank……….? Kindly Guide us…..Thanks Basu ! Mayuresh-Existing ECS will continue as usual. But fresh ECS registration will be stopped from 1st May, 2016. So you no need to worry. Thank you fir the very informative video. Good to heard you again ……Thanks again for sharing your valuable information…not only through your written post also parallel with video tutorial guidance. Your video tutorial guidance acts a SPICE…. in our regular reading diet….. Your humble VOICE …creates a PERSONAL BONDING along with a feeling of more closeness with YOU………..
Great… Very much value-able video. Keep creating such a value added, informative Video tutorials parallel to your written blog. One can easily understand and visualize the process by video tutorial. Also last but not least we are learning by having your personal touch of your “VOICE”.